I admit I’m not completely crazy about the gratin or the hash brown patty. With those two exceptions, I love pretty much every preparation of potatoes. Home fries, french fries, pommes Anna, latkes: I’ll take them all. Soon it will be the season of fingerlings and potato salads in my part of the world, but before we get there, I wanted to give you one last lovely use for full-size winter potatoes: smashing them! These were really popular a few years back in a variety of versions. Some recipes call for the potatoes to be almost mashed, while others — like this one — err on the side of structural integrity. The really brilliant part of this is the second baking, which browns and crisps some of the flesh of the potato. Wash the potatoes, then put a pot of water on to boil. When it is boiling, drop the potatoes in and boil until they can easily be pierced through with a bamboo skewer or fork. 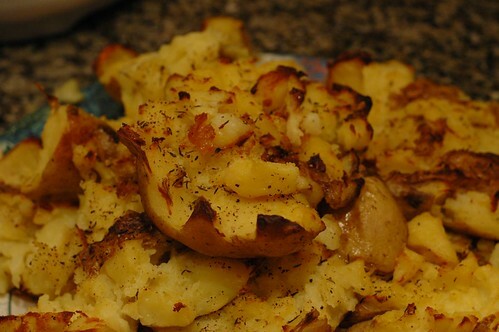 This takes 35-45 minutes for regular-size potatoes. Drain the potatoes in a colander, preheat your oven to 450 F, and generously grease a baking sheet with olive oil. Put the potatoes on the sheet and smash them! I found it most effective to cut a silt a couple of inches long in the skin of the potato, and then to smash it with a potato masher a couple of times. If you don’t have a masher, you could do the first squish with a heavy-bottomed glass or a cast-iron pan, and then finish with a fork. Try to make sure most of the insides end up on top of the skin. i think that adding the herbs makes these excellent–oregano is also a fine choice!